2009 was the year that the world that we knew fell apart. Unemployment figures went through the roof, many people learned the sad fact that there is no such thing as free money, the banks came a begging looking for our money to bail them out. The weather matched the mood of the year with rain, wind, snow and ice and no sunshine. January saw the AGM of Kilcorney Bowling Club which was held at Caroline’s Bar, for them the highlight of 2008 was the hosting of the European Dutch Moore Championships in Rathcoole. Kilcorney Communtiy Gym reopened after the Christmas break giving people a much needed reason to loose a few extra pounds. Kilcorney Social Centre was also a hive of activity with set dancing, Tuesday club and baby and toddler group back in action. Dia is mhuire diobh go leir a cairde and welcome to news report 996 from Millstreet. Fondest greetings dear listeners and I wish you all the very best on the snow ‘n ice free Tuesday morning. The Community Council Meeting which was deferred will be held to-night at the Wallis Arms Hotel starting at 8.30, All members please attend. The awful happenings in Haiti some days ago, shook the world, but here in Millstreet we felt a kind of affiliation with that country, because last years our community fundraised to enable Jerry Pat O Leary to go to that troubled land, as part of the Haven organisation, to build houses for those people who are so, so poor. Jerry tells us that the place where they worked is well away from the epi-centre of the earthquake and that the houses they built are still intact. He is having a meeting with the Haven organisation to-night to decide what further help they can be in Haiti. We will keep you informed. And please note that a fund for the cause has been opened at our Credit Union. THE second part of the Millstreet GAA review focuses on hurling where a number of teams came up short in both league and championships. Dwelling on the JAHC, a powerful surge in extra time allowed Kilbrin pull away from a gritty Millstreet to secure a 422 to 5-15 win in a dramatic first round played in Banteer. From a hotly competitive and a pulsating encounter, the pace and the tempo of the game was frantic from the outset and with 46 scores in total registered confirmed those in attendance received value for money. Thereafter, Millstreet flattered to deceive where a sharper Freemount possessed too much firepower for Millstreet on recording a 3-12 to 2-12 triumph in the 2nd round qualifier played in Kanturk. At the end of the hour, Millstreet yielded to the greater stickwork and greater combined play of Freemount. RAIL passengers travelling to Kerry on Sunday night (10th Jan) endured a nightmare journey home when engine failure caused the final service of the day to be almost five hours late arriving in Tralee. This was the evening of the snow and cold. 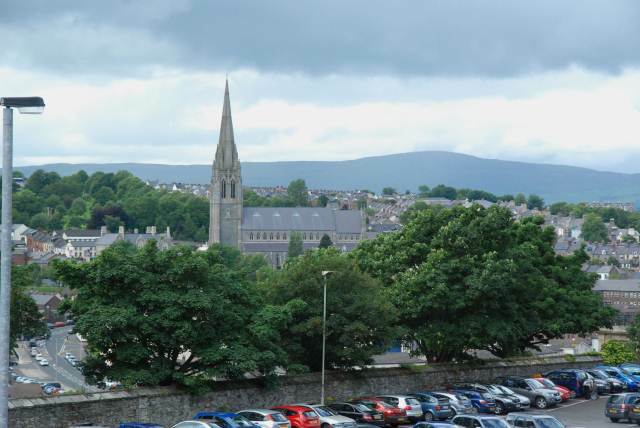 Commuters found themselves stranded between Millstreet and Rathmore for over two hours on an Intercity train with intermittent heat and lighting, when the 7.10pm service developed engine problems shortly after leaving Mallow Train Station. The train eventually arrived at Tralee at 3.47am on Monday morning, fully four hours and 42 minutes late for a journey scheduled to last three hours and 55 minutes. WEARY residents in Millstreet forgot about their lack of water for the past month on Sunday evening and community spirit took over as people put their artistic skills to the fore and built a giant igloo and snowman. For the estimated 16 householders at Old Coach Avenue in Millstreet it was a welcome break from the strife of the past month, as some residents have not had a drop of water out of their taps, while others went to Tubrid Well …. Full article from the Corkman Newspaper this week. Dia is mhuire diobh go leir a Cairde and welcome to news report 995 from Millstreet. Fondest greetings dear listeners and I hope that you are bearing up well to all the trials and tribulations caused by the inclement weather. Again this week I have no lotto results because like so many other things it too fell victim to the bad weather on Sunday night. We can only hope that it will go ahead on next Sunday night when it will be held at the Clara Inn with a Jackpot on €2 200. These times we really must take our hats off to our local radio station. Every one of the crew left no stone unturned to keep the public informed in minute detail of all the happenings or lack of happenings around the County. Its is at times like these that we see the value of having our own local station. Please support well at all times. Well done to Darragh Reardon on winning a few bob on the late night TV3 Game show Play TV. It’s notoriously difficult to win on Play TV because there are so many different correct answers: you need a lot of luck! For anyone interested in it, there is a good discussion on boards.ie about PlayTV and their solutions. Ignoring the sub-zero freezing conditions, swimmers and supporters made their way to the famous Boeing for the second annual New Year’s day swim. Those participating defied the arctic weather to support the beneficiaries from the staging, the worthy Irish Cancer Society Night Nurses and LTV2. …and at least 16 new houses in an estate in Millstreet were also without water. A New Year’s Day charity swim at the Boeing aids Millstreet Hospital. The two day Millstreet Coursing meeting enjoyed favourable weather as a dedicated band return to the Millstreet Town Park. Altar Girls introduced to serve at masses for the very first time. 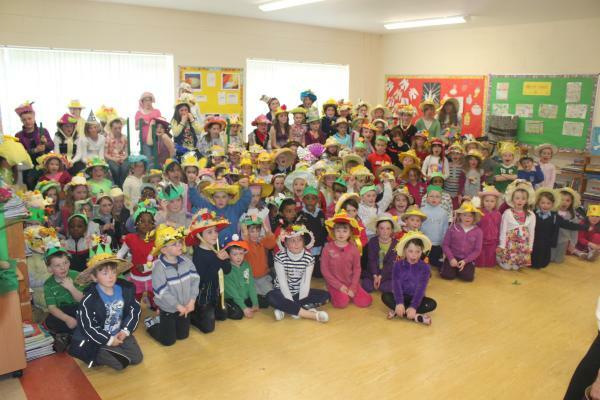 Millstreet Mother and Toddler group celebrate 10th birthday. Cullen and Special Needs Association launch annual Weigh In. Patrons either side of the county bounds take the trip to the Rathmore Marian Players pantomime “Mother Goose”. Millstreet, Rathmore on route 40: Cork to Tralee and return, not being served due to ice on roads. Dia is mhuire diobh go leir Cairde and welcome to News Report 994 from Millstreet, and welcome to Twenty Ten. Our Weekly lotto Draw will resume on Sunday next January 10th. Starting off at the Clara Inn with a Jackpot of €2,200. Well regardless of the weather, we had a great Christmas. Our newly refurbished Church looked great for the Nativity Mass. A few changes were evident, with the pulpit now beside the extended alter. It looks great and is used by those doing the readings. The Crib was placed just inside the entrance door, down at the end of the church, for the first time in many, many years. Donations for the crib are for charity every year. Dia is mhuire diobh go leir a Cairde and welcome to news report 993 from Millstreet. Fondest greetings dear listeners and I wish you all the very best on this very seasonal Tuesday morning with treatcherous and snow all around. Well it won’t be long now. Just a few more days and by all accounts its going to be a white one. I’ll be killed for saying it, but I love snow. And a white Christmas would be such a bonus. No matter what the weather,the shopping goes on with perhaps some people forced to shop at home because of the weather. The Marquee will be in the Square till Christmas Eve and vouchers at the Credit Union will solve your gift problem at any price, And by what I hear, they are proving very very popular. 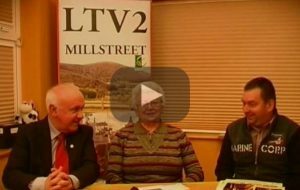 Some worth €20 each, were offered as prizes on LTV2s program last week and the lucky winners were, Breda O Leary, West End, Sean and Delia Kelleher, Macroom, Kathleen McAulliffe, Millstreet, and John F. Tarrant Rathcoole.Congrats all round. MILLSTREET TOWN FILLED WITH THE SPIRIT OF CHRISTMAS: The festive season is officially underway in Millstreet after the town switched on its Christmas lights last Friday evening. Despite inclement weather and driving rain, excited children and parents turned up in the Town Square for the big switch on. 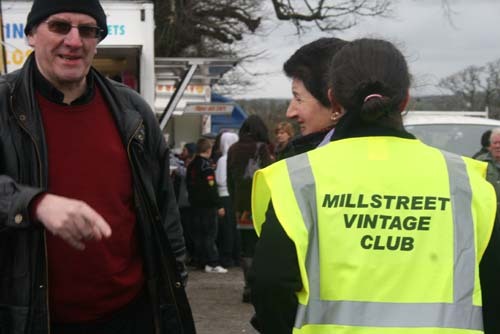 The event was hosted by the Millstreet Development Group who helped whip up just the right jolly atmosphere for the occasion and kept the crowd entertained. Live performances came from Millstreet Comhalthas Ceolteoirí Eireann and there was a warm welcome for a horse drawn carriage with occupants Bertie Buckley and Anna Balla in periodic costume, filling the bill of lord and lady of the manor splendidly. Dia is mhuire diobh go leir a cairde and welcome to news report 992 from Millstreet. Fondest greetings dear listeners and I wish you all the very best on this very cold but seasonal,Tuesday morning. A very interesting meeting of the Community Council was held at the Wallis Arms Hotel on Tuesday night. Topics for discussion included the upgrading of our Youth Centre and the fitting of Astro-Turf surface on our tennis courts. It was also decided to host a community Council Awards Social this year at a date yet to be decided. 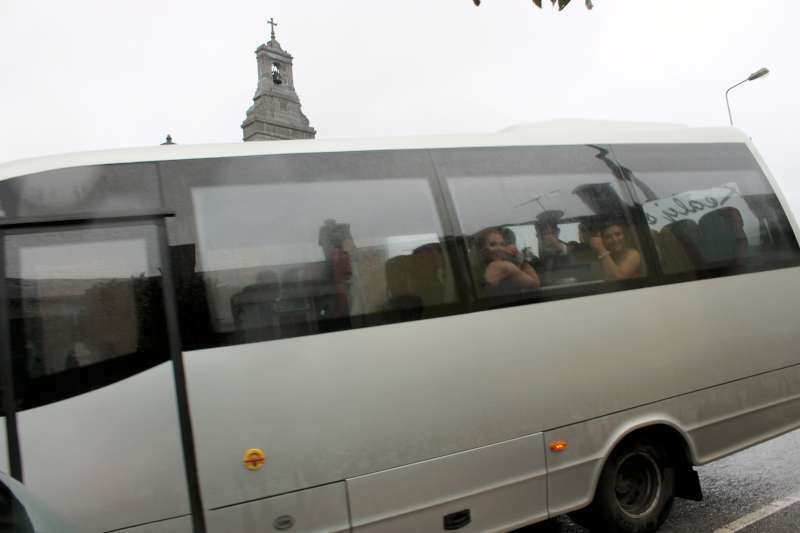 Eileen Murphy reported on our Youth Club, and said that there are 64 members now with parents coming to help on Friday nights when they meet from 8 to 10 Theres room for more, but more parents must come on board with the increase in numbers. The after school service will resume after Christmas. The Defibulators have now been placed at the Youth Centre and at the Garda Station. The full list of trained personnel will be announced in the near future. Joseph Lawlor was co-opted on the Council, on that night.and before the meeting ended a special Presentation was made to Fr. Gerard O Leary on behalf of our Community. From the Cookery Demonstration, to flower arranging, to COPE Foundation, all the recent news from Kilcorney can be read on the Corkman website. IFA PRESIDENCY: The leadership elections for the IFA is up and running, Millstreet and Ballydaly branch members will vote on convening in the Canon O’Donovan Centre on Wednesday, December 9, at 8.30pm. Three candidates are seeking to succeed Pádraig Walshe for a four-year term as IFA president. In the field are Kilkenny county chairman John Bryan, deputy president Derek Deane from Carlow and dairy committee chairman Richard Kennedy of Limerick. The full article is on the Corkman Newspaper, and also covers all the other happenings in Millstreet in the last week. Dia is mhuire diobh go leir a Cairde and welcome to news report 991 from Millstreet. Fondest greetings dear listeners and I wish you all the very best on this wet ‘n wintery Tuesday morning. December 8th ,the Feast Day of the Immaculate Conception. A Holy Day of Obligation. Here are the results of this weeks parish Lotto draw which was held at Corkery’s Bar on Sunday night. Numbers drawn were 13, 15, 23 , 27 . AND THE LUCKY WINNER OF €16,000 was Margaret Cooper, Cullen and her daughter Maura. 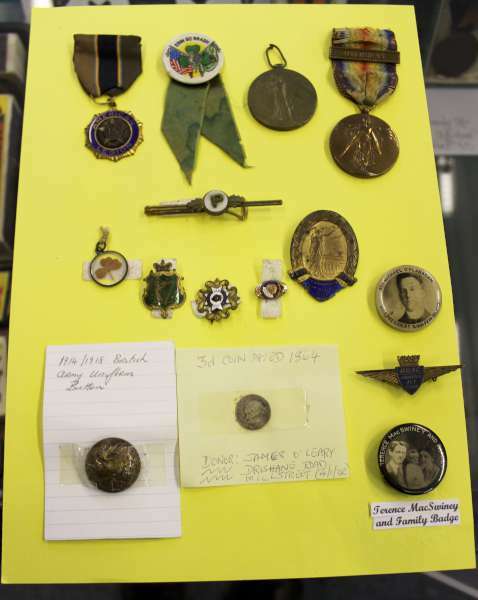 The seller was ,first cousin, Margaret Burke and she got €1,600 sellers prize. Because the Jackpot was won there was no €50 prize, and €20 each went to the following ten people. John O Callaghan, Kilcorney, Margaret Hayes , Gneeveguilla, Mary Dinneen, Clonbanin Con O Connor, Rathrue, Mattie O Riordan, Shanaknuck,, Ann Kelleher, Tullig, Christina O Donaghue, Lackabawn, Jerry O Leary, Rathcoole, Len Leader, Kilcorney , and LTV2 ,Millstreet. Jackpot for next week €2,000 the draw a the MalPasso Bar on Sunday night. Dia is mhuire Diobh go leir a Cairde and welcome to news report 990 from Millstreet. Fondest greetings dear listeners and I wish you all the very best on this cold, wet and windy Tuesday morning, 1st of December. A cookery demonstration entitled “Tastes of Christmas” will be held at our Community School tomorrow, Wednesday night. December2nd, with Master Chef Frank Moynihan doing the cooking. Admission €10. Proceeds to Baby Jacob.The Irish Heart Foundation and Cystic Fibrosis. Starts at 8, all welcome. Cairde Muintir Mhuire will host “Prayer Through Song” with the renowned Gospel singer David Parkes at St. Colemans Church in Macroom, to-night December1st. Starts at 8, Doors opened at 7.15, admission €10. Proceeds to the Cairde Muintir Mhuire Fund.